With funding from the Memorials and Special Gifts Committee, the Conference Room will be updated to provide a more functional, collaborative meeting space. Work will begin on 2/12/19 and is scheduled to be completed by the end of March. 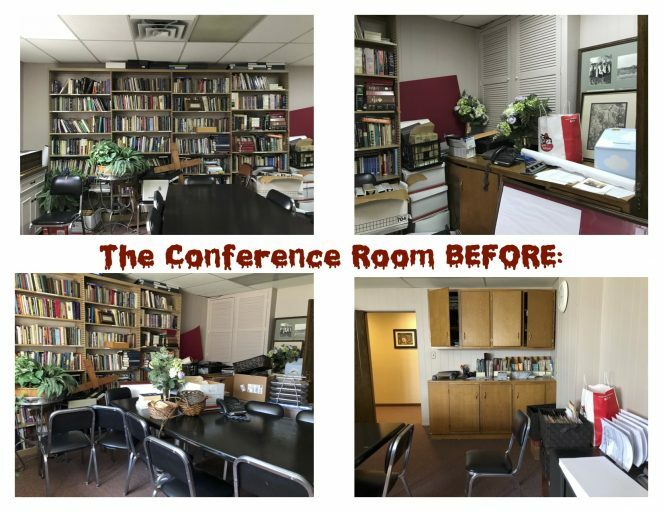 The current cabinets will be replaced with new cabinetry to increase storage space, the sink will be removed, new counter tops will be installed, the book shelves will be removed to allow for a monitor on that wall for projecting documents, video conferencing, etc. ; the walls will be painted, new lighting and ceiling tiles will be installed, the conference room table will be stripped and the original oak restored. During renovations, the copy machine will be located in the vacant office across the hall. The conference room will not be available for use during the renovation, thank you for your patience!